Ol' Joe is as poor as Job. He ain't worked in well over a year. This is a phrase that I know a good many of you have heard. If you're a Bible reading and believing somebody, you know all about how hard of a time poor ol' Job had. He was a righteous man and God allowed his faith to be tested by Satan. He lost his children, his health, everything he owned, and his livelihood. Through all of that, he remained faithful and his perseverance was rewarded. 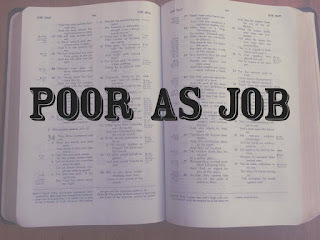 So to say "he/she is as poor as Job" would be comparing someone's situation to the worst of the worst. Over time, this phrase has been embellished to include Job's critters. "Poor as Job's turkey" is one that I've heard growing up. I'm not sure that ol' Job even knew what a turkey was but if had he belonged to Job, you can bet that he was poor. I found that some areas use "poor as Job's cat" but I don't remember hearing it around here. Another phrase that includes Job is "he/she has the patience of Job" and knowing what all Job went through would mean that this person was a very patient person. This is definitely one thing that me and Job do NOT have in common. I'm working on that. Have you heard or used these phrases where you're from?